Have you been following SOCHI 2014 Winter Olympics? Despite of all terror worries and bad weather, some records have been made and they have been putting up some amazing spectacles. Didn’t manage to get the front seat in the games? How about bringing Russia to your table instead? 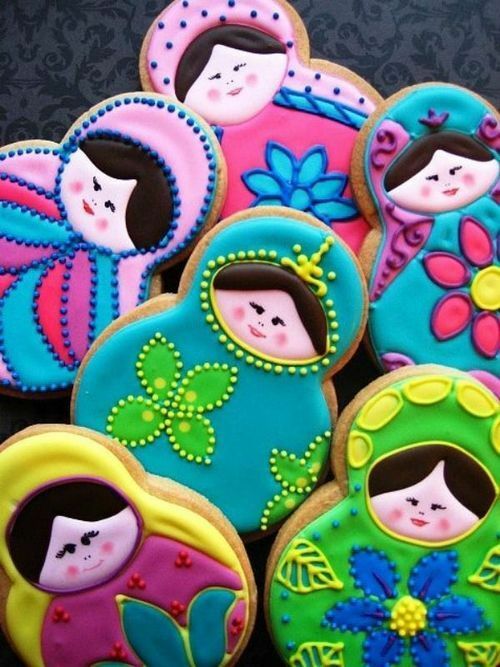 When it comes to Russian culture, we know the nesting dolls, Matryoshka, onion-shaped church domes, and Dostoevsky…The culture has had a fair share of exposure, yet we don’t know so much about the food culture of Russia. The impressions? Meat jelly and vodka? For those of you who might find the cuisine too much of an enigma, we put our spotlight on Russian cuisine this week. You will find something very interesting and different yet comforting and very tasty. Russian cuisine reflects the food culture in the harsh cold climate, just as you can see in warm soup and stews with fresh meat and fish, starchy filling dumplings as well as conservation of vegetables in pickles. But their food has an interesting twist and a mix of flavours as their cuisine is enriched by the cultural integration originating from Russia’s expansion embracing other Slavic food countries and western food influence. We can find something different and exciting yet familiar and comforting. Beetroot, this all familiar vegetable, is a staple in Russian kitchen and is used very often and transformed into soups and salads. Its earthy flavour goes so well with the sourness of pickled vegetables and its nutritious make-up and the vivid colour makes this vegetable a wholesome awesome superhero of the kitchen. Take Vinegrette, whose name of the dish obviously derives from French cooking and the word, vinaigre (as in French salad dressing). It is made with boiled beetroots, carrots and potatoes with sauerkraut, gherkins, onions and peas, dressed with vinaigrette or vegetable oil. 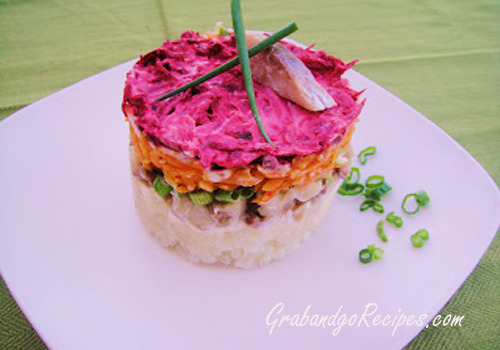 Another colourful salad is Dressed herring. It’s a salad made with layers of diced salted herring, grated and boiled vegetables such as beetroots, carrots, potatoes, chopped onions, hard-boiled eggs and mayonnaise. This rather wholesome salad is served in special occasions such as New Years and Christmas parties. There are so many varieties of hot and cold soups in Russian cuisine from clear fish soup(Ukha), cabbage soups(Shchi) to cold soups made of fermented rye bread beverage called Kvass (Okroshka). 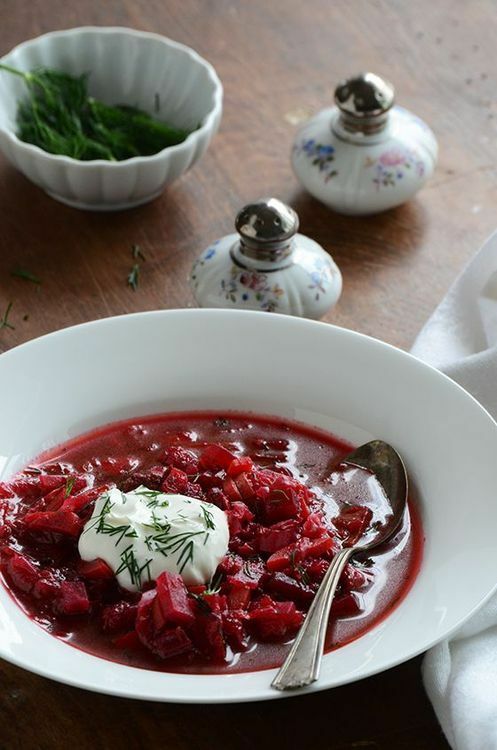 One of the most known soups is Borscht (also called Borsh), which has an Ukrainian origin. It’s a soup that is known for its vibrant ruby colour (of course, from beetroot!). It’s made of beef or pork broth and made starchy with beetroot and often carrots, onion and cabbage are added. It is a wholesome and nutritious popular soup. A dollop of smetna (sour cream) is added in soups like Borschi. The beautiful ruby colour looks even prettier with rich and creamy yet refreshing dollop of smetna and it makes everything work together so well. Prefer something hot and spicy? Then try Solyanka. It’s a stew made of meat, fish or mushroom broth with interesting layers of salty, spicy and sour flavours owing to gherkins, capers, lemon and sour cream. Depending on the broth, it can have meat (chicken, beef, sausages, ham) or fish (such as salmon or crayfish). Spices such as dill and parsley are added, and give the soup a reinvigorating kick that makes it even tastier. If you like noodle soup, try Lapsha. Lapsha is prepared either in chicken, mushroom or milk broth. Noodles are usually made with wheat flour or buckwheat, egg yolks and salt cooked in broth. It’s such a simple noodle soup but comforting and perfect on a rainy day. Things like aspic, meat in jelly stock, might put you off but there are meat dishes that are very familiar to us already and very approachable. Take Shashlyk (Russian kebab), Beef Stroganov (Stroganoff), chicken Kiev (Kiev makes us think it’s from Ukraine but according to historians, it was invented in Moscow, Russia!). All of these dishes are our ready-meal favourites nowadays. Shashlyk kebab is a popular BBQ item in Russia just how we prepare burgers on a grill. Cuts of meat marinated and grilled in a skewer with onions are just simply the best. Stroganoff is a dish made of sautéed beef pieces in smetna, often served with pan-fried chips (Serving it with chips is traditionally Russian apparently!). It’s an elegant one dish meal. Chicken kiev is chicken cutlet, stuffed with garlic butter with herbs, and breaded and fried. When you slice into the chicken, the juice of chicken and butter ooze out. It’s a classic family favourite that never gets bored. 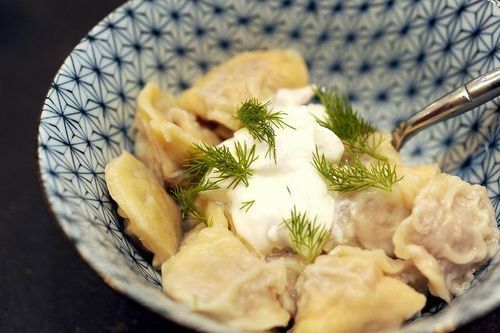 Another dish worth mentioning is pelmeni. Pelmeni is a Russian take on Italian ravioli. The name means ear-shaped breads. Little dough shells are packed with well-seasoned meat and fresh coriander, boiled and served with butter and sour cream. Pelmeni can be deep-fried or steamed as well. There is a theory that this ear-shaped dumpling might come from Chinese jiaozi and this just goes to show how Russian cuisine infuse culinary influences from both east and west. 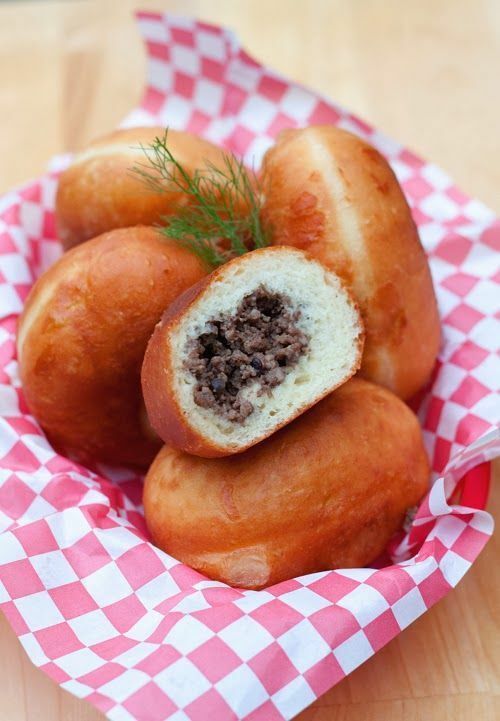 Pirozhki (Piroshki) are buns/pastries often stuffed with boiled meat, sautéed fish, boiled eggs, sautéed vegetable and rice. The concept is almost like a Russian version of Cornish pastry. But the difference is that it often has boiled eggs and they can be shallow-fried instead of oven-baked. There are sweet varieties often filled with cheese, jam, or stewed fruits. It hits everyone’s spot. Or how about Blini? Blini are pancakes (of wheat or buckwheat) as thin as crepes and it is often served with caviar, butter, smetna, or fruit preserves on top. Well, caviar might not be such an accessible or familiar food item. But blini can be a very nice appetiser or breakfast, served with smoked salmon, cheese and herbs, a dollop of cream and jam. How about trying a sweet cheese frittata called Syrniki? It’s made with curd (cottage cheese), flour and a dollop of vanilla extract and it is pan-fried and served with smetna, jam, honey or apple sauce. It’s a crispy pancake but extra special because when you bite into it, it has an amazing creamy texture inside. It’s a treat you’ll love. If you decide to give Russian cuisine a try, you should try their famous almost non-alcoholic (as the alcohol content is less than 1%) drink, Kvass. 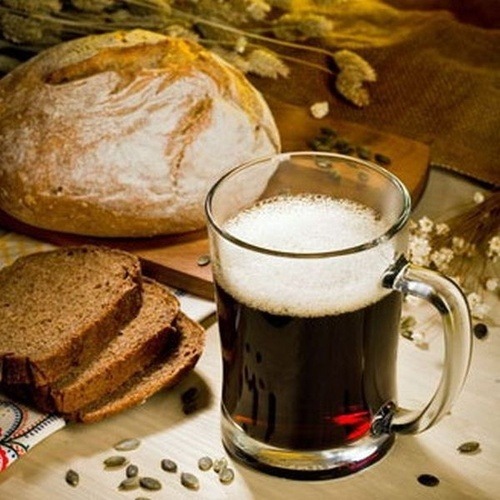 As mentioned in the soup section, it is a fermented beverage made of black or regular rye bread. It is a sweet and sour drink with distinctive rye bread flavour. Fruits (such as raisins) or herbs (such as mint) are used to add sweet and refreshing touch. Also why don’t you try Sbiten? Sbiten is a hot honey based drink made with water, honey, spices (such as cinnamon, ginger) and jam. It can be made alcoholic by replacing water with red wine or vodka. It was a popular drink until tea and coffee were introduced to Russia in the 19th century but the drink is making a comeback nowadays. There always seems to be some enigma and mysteries around the country but the world’s biggest country holds a rich culture including the culinary aspect and they have a lot to offer and to be appreciated. Just as the Winter Olympics has got our attention to the country, it’s time for us to discover the unknown, this beautiful cuisine!